In 2015 Cartoon Network Games and developer Grumpyface Studios released Steven Universe: Attack the Light, one of the best mobile role-playing games ever. This summer they’re back and on game consoles with Steven Universe: Save the Light. Cartoon Network Games has produced some very good mobile games and some not-so-great console games. Getting Attack the Light, Teeny Titans and Powerpuff Girls: Flipped Out developer Grumpyface to start making console titles sounds like an excellent solution. Steven Universe: Save the Light is a sequel to the hit 2015 turn-based mobile RPG Attack the Light. The first game saw Steven acting as a cheerleader of sort for his three core gem companions, Amethyst, Pearl and Garnet. Steven would dole out power-ups, items and buffs while the girls attacked enemies directly, using a timing mechanic to block incoming attacks. Judging by the first three screens from Save the Light, Steven plays a more active role this time around, and the Crystal Gems will be joined by supporting characters like Greg Universe and Connie. Series creator Rebecca Sugar contributed to an original story for the game. 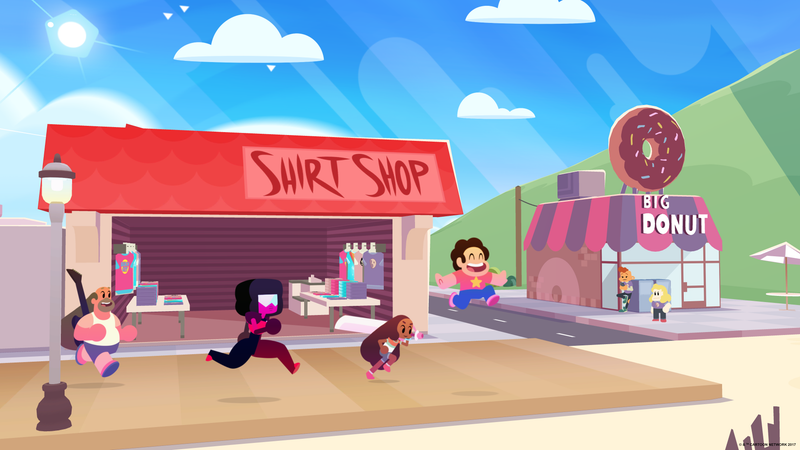 Steven Universe: Save the Light’s gameplay debut will take place this weekend at PAX East. It’s sharing a Cartoon Network Games panel on Saturday with OK K.O.! Let’s Be Heroes, a console game based on the upcoming show, featuring the work of artist Ian Jones-Quartey and developed by Capybara Games of Super Time Force and Superbrothers: Sword & Sworcery EP fame. OK K.O.! Let’s Be Heroes, due out this fall.